The Federal Reserve said industrial production dipped in August for the first time in seven months, largely because of a slowdown in auto manufacturing. Except for automakers, factory output remained steady while mining and utilities increased production following declines in July. 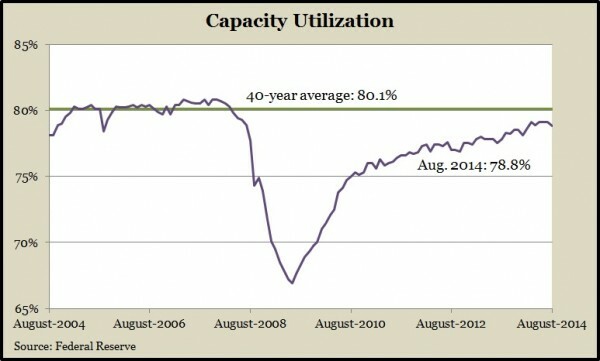 Overall industrial output remained above the pre-recession level for the 12th month in a row. 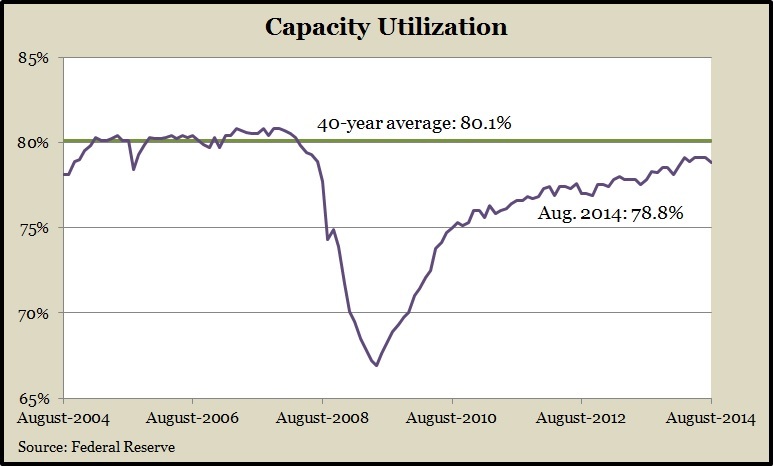 Meanwhile, the capacity utilization rate dropped to 78.8% – even lower from the long-time average, indicating room for further growth before inflation becomes a problem. Annual inflation on the wholesale level, measured by the Producer Price Index, stayed below the 2% rate cited by the Fed as economically sustainable. The Bureau of Labor Statistics reported the August rate rose to 1.8% from 1.6% in July, as analysts had expected. Both food and energy prices fell as the index overall was unchanged from July. The broadest measure of inflation stayed lower than expected in August – and lower than desired by the Federal Reserve. The Bureau of Labor Statistics said the Consumer Price Index slipped 0.2%, led by a 4.1% decline in gasoline prices. The index fell for the first time since April 2013. The annual rate of inflation rose to 1.8% from 1.6% in July, still below the Fed target of 2%, suggesting the economy isn’t growing fast enough to trigger inflation fears. The 30-average inflation rate is 2.8%. After apparently peaking in 2013, the U.S. housing recovery continued to be volatile in August as the annual rate of housing starts fell unexpectedly by 14.4% after rising 22.9% in July. The Commerce Department said new construction of multi-family houses dropped more than single-family last month, though they outpaced single-family in the last 12 months. As with housing starts, August building permits declined after a surge in July. Both indicators remain around the levels reached before the 2008 financial collapse but are a far cry from the long-term pace. Permits were approved at an annual rate of 998,000 in August, vs. the 30-year average of 1.37 million. The moving four-week average for initial unemployment claims fell for the first time in three weeks, settling back near its lowest level since 2006. Labor Department data suggested American employers remain reluctant to part with workers. Jobless claims have stayed below long-term averages every week since the end of 2012. The Conference Board’s August index of leading economic indicators pointed to continued moderate economic growth at least through the end of the year. Weaker numbers for building permits and non-defense capital goods orders will slow expansion from the first half of the year, the business research group reported. The August gain was the slowest since January for the index but follows a robust July.